Review the UN Security Council Resolution 1325 and the importance of its field applications in Iraq. Two panel discussions, the first on the issue of missing persons, women and peace, and the second on the legal challenges facing the family led by women having missing persons. Mr. William Warda diagnoses the suffering of the families of the missing and calls for the creation of a clear administrative and legal governmental reference to coordinate and facilitate the transactions of these families. The ICMP mission prepares proposals and recommendations in the second plan to follow up the affairs of missing persons and strengthen coordination with the Iraqi government in this regard. 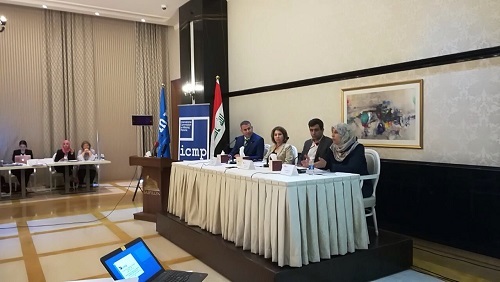 Hammurabi Human Rights Organization HHRO participated in the expand meeting organized by the mission of International Commission on Missing Persons ICMP of Iraq in coordination and cooperation with governmental and civil authorities. The meeting was attended by Mr. William Warda Public Relations Officer of HHRO, Mr. Adel Saad the Media Advisor. 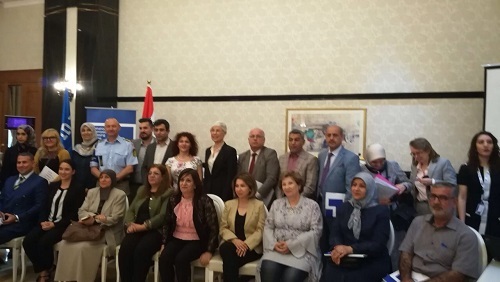 Wide spectrum of participants of the European Union Commission, Diplomats, civil society organizations and human rights officials ,Government officials from the Ministry of Interior and Ministry of Defense, the Secretariat General of the Council of Ministers plus media officials. The agenda of the meeting included an opening speech by the US Minister Counselor for Political Affairs in Iraq, Mrs. Sylvia Curran, then a welcoming speech by Dr. Ibtisam Aziz the Director-General of the Women’s Empowerment Directorate in the Council Of Ministers, Mrs. Ma ba Talhaw Nunu Dihemo Adviser to the Office of Gendarmery Affairs in the United Nations Mission in Iraq / Nineveh, a speech by Mrs. Iman Abdel Rahman director of the Institute of Women Leadership. Then an open discussion session took place on the issue of missing persons on women, families and communities, participated by Mrs. Suzan Aref coordinator of joint work between the sectors involved in the implementation of UN Security Council Resolution 1325, and Mr. Murad Ismail Executive Director of Yazda Organization and Mrs. Sulaf Mahmoud Director of Ajial Charity Society for the development of intelligence and creativity. The participants in the dialogue concluded that the achievement of the first Iraqi national plan to follow up the issues of missing persons and to implement the provisions of resolution 1325 was relatively busy with some gaps and obstacles. After a short break, the participants held another discussion session on the subject of legal challenges facing female-headed families having missing. Among participating in the discussion session were Mrs. Hind Jamig Head of the Department of Minors Care in the Directorate General for Minors Care in the Ministry of Justice, Mrs. Amal Jalal of Supreme Committee for women's affairs in the Kurdistan Regional Government - Iraq, Dr. Amera Al Baldawi Director of Mother of Orphan Foundation for Development and Mr. Haider Kathem Khader Director of Sawa Human Rights Organization. It come to light through the proposals that there are many shortcomings, routine and failure in measures should be adopted to help families led by women suffering from the serious effects of the missing. In this context, Mr. William Warda Public Relations Officer of the Hammurabi Human Rights Organization, spoke of the suffering of families who are missing in their rights under the law, calling for the need for a single governmental authority to take care of the families of the missing or a coordination center between offices in concern. Mr. Warda's diagnosis was interesting because it will solve many of the current problems of missing persons. After that, Mrs. Kari Kumer of the ICMP mission presented a summary of proposals presented during the meeting, stressing the Iraqi awareness of this humanitarian issue. Mrs. Lina Larson, Chairwoman of the ICMP Committee, concluded with a statement in which she promised to coordinate with the Iraqi government and stakeholders In order to help develop a second plan to follow up the issue of missing persons.